If you see a single moth flying around your living room, you probably left a window open, but a whole collection of moths in your closet or pantry probably got in a different way. There's a good chance they entered -- perhaps as larvae -- on someone's clothes or in a grocery bag. Destructive moths love the shelter and nourishment they find in a pantry, an open bag of dog food or your linens. 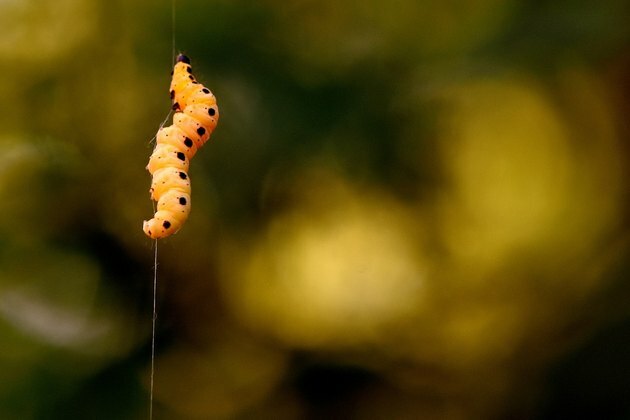 Insecticides aren't much good for getting rid of them -- it's better to throw away infested food, dry-clean infested clothing and do a deep clean of the surroundings. If you don't want them to come back, and you want to avoid toxic mothballs, keep food containers closed and dry-clean your clothes before storing them. Adult moths are a nuisance, but it's the larvae that do the damage. If you're lucky enough to host a single outdoor moth, such as Cecropia (Hyalophora cecropia), in your living room, enjoy the treat. Large moths, such as Cecropia -- with moon-shaped markings on their wings -- are usually beautiful and completely harmless. The moth probably came in through an open window, and if you leave it alone, it will undoubtedly leave the same way. Brown House Moth (Hofmannophila pseudospretella) -- Measuring less than a half-inch in length, with a wingspan that approaches one inch and brown wings with bronze flecks, the female brown house moth can lay 600 eggs at once. The hungry larvae feed on dry food in the pantry and natural fiber clothing. Pantry Moth (Plodia interpunctella) -- Also known as the Indian meal moth, this household pest is perhaps the most destructive of all the moths. It has the same coppery coloration on its wings as the brown house moth, and it's about the same size, but its wings are gray. It infests pantries and linen drawers with equal zeal. Females lay up to 300 eggs at a time, and as is true with all destructive moths, the larvae do the damage. Webbing Clothes Moth (Tineola bisselliella) and Casemaking Clothes Moth (Tinea pellionella**)** -- Clothes moths tend to stay around the clothing they've infested, and they are smaller than moths that infest pantries. They have a general golden-brown coloration, with reddish hairs on the head, their distinguishing feature. If you notice them in a closet or drawer, damage to your clothing is almost certain. These moths feed almost exclusively on natural fabrics, especially wool. Pantry moths and house moths may enter your house through an open window or door, or they may find their way in through a crack in the eaves. The larvae often surreptitiously hitch a ride on someone's clothing or in a grocery bag. Pantry moths are especially likely to infest bulk cereals and grains. Because clothes moths seldom wander far from the clothing they've infested, and because they don't like the light, they -- and their larvae -- are usually stowaways on clothing, particularly items purchased at second-hand outlets. Insecticides have limited use against moths. You may kill some of the adults, and possibly some of the larvae, but you'll contaminate your clothes and/or your food in the process. A better way to get rid of moths in your pantry is to throw away infested food and deep-clean the shelves, walls and floors with soap and water. If you spot moths in a closet or a drawer, remove all the clothing you suspect may be infested, throw away all the damaged clothing and dry-clean the rest. Dry-cleaning kills the larvae and eggs that still may be on the clothing. Keep in mind that clothing moths prefer natural fabrics, especially wool and fur, so pay special attention to them. Mothballs were invented to prevent moth infestations, but both the ingredients used to make them -- paradichlorobenzene (PDB) and naphthalene -- have been proven to be dangerously toxic. PDB is a suspected carcinogen, and naphthalene can cause liver and eye damage, particularly if eaten by a curious child or pet. If you opt to use them, do so sparingly, and put them only in places far out of the reach of curious hands or mouths. Keep in mind that mothball crystals produce a persistent odor that can pervade woodwork and clothing, which may linger long after you remove the mothballs themselves. Once you've rid your pantry of a moth infestation, the best way to prevent a recurrence is to keep your food in sealed containers and check items carefully before you put them into storage. Be especially wary of bulk grains, cereals and dry pet food. The strategy for protecting your clothing from clothes moths is basically the same. After you've inspected your clothing, thrown out damaged items and dry-cleaned the rest, continue to clean clothing meticulously before putting it away. Some moths attack clothing -- not for the fabric -- but for the organic oils left by perspiration and dried food. If you suspect the moths may have entered through gaps in the eaves or through windows you want to leave open, you might want to treat these areas with an insecticide. You can also trap adult moths with safe traps that attract the moths using natural pheromones to prevent them from laying more eggs. If you think the moths came in through an open door or window, it's probably best to keep it closed as much as possible.